A friend of mine has theorized that that US citizens would sooner vote for a black lesbian muslim before they would vote for an atheist, so ingrained is the notion that one must believe in a deity in order to govern. While I would agree that, certainly among the more vocal Christians, belief is fundamental (pun intended); but they still put Christianity above all else. So much so, that they will have rather have no religion than, for example, Satanism, on public display. 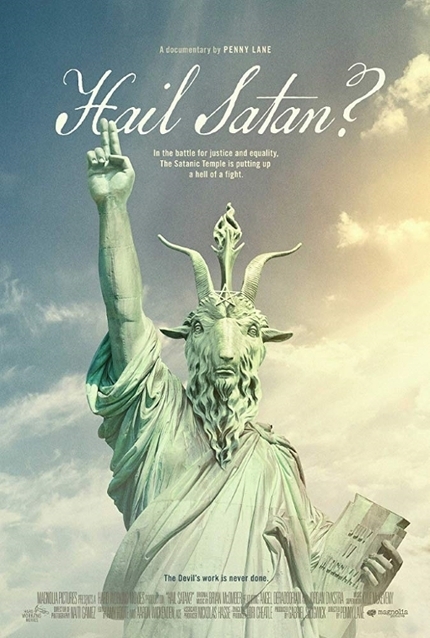 Or so it would seem from Penny Lane's astute, funny, and insightful documentary, Hail Satan? But that would imply that the film is only about the Christian right's reaction to one specific group that is the focus of the story, The Satanic Temple. The film also looks at the group itself, its humble beginnings, its desire for more political action than its predesessors, and what exactly it is that Satanists believe in, and to espouse in their daily lives. Partly because of her subjects, and partly through her own style and approach, we get a portrait of a rising cultural phenonmenon that is fun, funny, smart, engaging, deceptively subversive, and unafraid of looking American Christian culture dead in the eye and pointing out its extreme hypocrisy and deceptions. And it is a fast-growing group of 'rebels': from 3 to around 50,000 in just a few years. And I put rebels in quotes deliberately because, as Lane examines, are they rebels? Or are they, as they say, patriots? The US constitution does guarantee freedom of religion, and so the group takes their activisim to the courts, fighting local and state governments when they seek to impose Christian theocrary, either through prayers in the legislature, or the 10 Commandments on government property (the source of which was a shock to me, as I'm sure it will be for many). And it's also (for the most) a pretty diverse group: all races, gender identities, socio-economic classes, etcetera, seem to be represented (though I had to giggle a little when the male, white, cis-gendered leader of the group, the self-named Lucien Greaves, noted how shocked he was to be on the receiving end of discrimination). Some are from atheist backgrounds, others were devote Christians, and it certainly isn't all black leather and heavy metal music. Though theatrics do make up a big part of the group. But, as Lane pieces together and presents to us, the Satanic Temple is more about its political activism, the creation and maitenance of a community, and patrioticism at a time when that word is used by different sides for different reasons. But as the group gets larger, is it falling victim to processes and self-imposed limitations and guidelines that at one point it sought to fight against? Does its own tenets mean that there is no more room for debate, a cornerstone of the religion? And can you call it a religion if there is no deity that is worshipped? Lane's film doesn't answer all the questions you might have, but it does provide a lot of information, and more inportantly, packages it in a fun and smart 90-minute time frame that follows its path wherever it might meander, while still remainign focused. Hail Satan? is a terrific and delightful time, the best kind of representation of an unknown subject that both embraces and questions.